Hong Kong’s first-ever cruise and yachting event, International Cruise and Yachting Festival (Hong Kong) 2018, is scheduled to be held from November 22 to 25 at the Kai Tak Cruise Terminal, Kai Tak Runway Park and Kwun Tong Typhoon Shelter. feature the presence of mega cruisers, super yachts and pleasure boats as well as a wide range of watersports equipment. 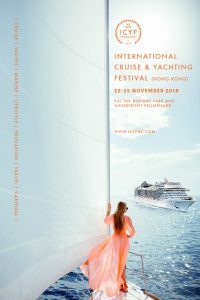 With the full support of the Hong Kong Cruise and Yacht Industry Foundation, the Festival (ICYF) organiser will work closely with the relevant government departments and industry associations to bring about an interesting activity program which will promote public understanding of Hong Kong’s waters and the sustainable development of the associated economies. According to the Association’s Executive Director, Miss Kara Yeung, ICYF is designed to promote Hong Kong’s economy in another perspective, covering leisure tourism, shipping and logistics, retail and shopping, finance and insurance, which will in turn create employment opportunities and serve the needs of the Hong Kong people. More importantly, it will help consolidate Hong Kong’s position as an Asian Shipping Centre, Cruising Hub and Quality Tourism City, providing the impetus for the development of the marine-related industries. As the cruise and yachting industry requires professional managers to maintain growth, she said the Association will organise a series of forums during the festival to promote exchanges in maritime law, insurance and finance. On education, the Association will work with Maritime Services Training Institute, Hong Kong Maritime Museum, Hong Kong Polytechnic University college of professional and continuing education, HKU School of Professional and Continuing Education, Hong Kong Institute of Vocational Training, Vocational Training Council etc to provide the latest training information to visitors interested in a career at sea. With its natural seaside setting, Hong Kong is well positioned to take full advantage of the scenic beauties of its islands. Miss Yeung said the Kai Tak Cruise Terminal can be used a launch pad to promote Island Tourism with the cooperation of cruise charters and travel agents. During the festival, the organiser has plans to provide shuttle ferries to facilitate visitor traffic and provide them with a direct encounter with the pleasures at sea. On a boarder perspective, the Festival will provide a platform for participants to explore the opportunities that will be available under the Belt and Road Initiative as representatives of global brands, maritime industry leaders and professionals will get together for exchanges and sharings. The organiser has also announced the appointment of Media Services as the Public Relations Consultant and FEED as the Sales and Marketing Consultant of the Festival.